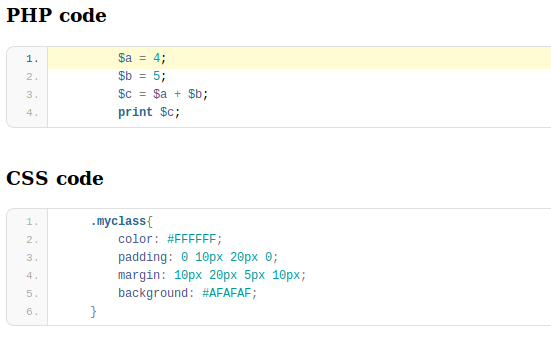 EnlighterJS is a free, easy-to-use, syntax highlighting plugin developed for MooTools. Using it can be as simple as adding a single script and style to your website, choosing the elements you wish to highlight, and EnlighterJS takes care of the rest! It supports syntax highlighting to number of languages and scripts. It can be added easily with adding data-enlighter-language attribute to the <pre> element in your html page. To integrate in your webpage link the Enligher JS css and Js files. Also link the mootools Js file too. Prepare your sourcecode by giving the element (containing the code) an optional data-enlighter-language attribute with the language of the snippet. Visit the EnlighterJS home page for more information.